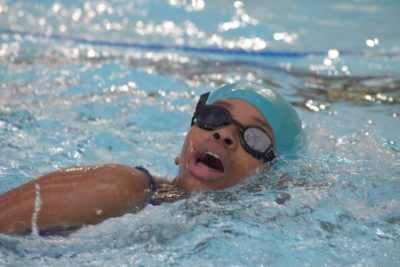 On Monday January 15th, Stanborough students took part in the much-anticipated Annual Swimming Gala. Despite the cold, grey and rainy weather, Mr Allen, Mr Prince and Mrs Zivanov drove the excited students to Westminster Lodge Leisure Centre. Students from Year 7 all the way to Year 10 joined the competition. The time-keepers and referees were Ms Brewster, Mrs Pavlovic and Mr Muraya, working alongside Mr Kumi, the Head Referee and Order of Events. As the swimmers raced against each other, loud cheers could be heard from the supporters of each house: Greenfell, Livingston and Shaftsbury. Heartfelt thanks go to our dedicated staff, Mrs Sinclair, Mrs Dixon, Mrs Gengan and Mr Nalli, for keeping the happy students in tip-top shape as they were representing the school. A big thank you also goes to Mr Zapotichny, our photographer, for taking amazing shots of the students as they swam and cheered each other on. Congratulations to our athletes for their fantastic performance! Thank you all for supporting the ADRA gift Box Appeal 2017! Together, we packed 106 boxes which will bring joy to children at the Ksizbia Refugee Camp, in Rwanda. During the last half-term break, we loaded the school minivan with all the boxes, and even strapped the seat belts on to make sure they made it to ADRA’s storage house in pristine condition! After quality control, they will start their long ship journey to Rwanda. 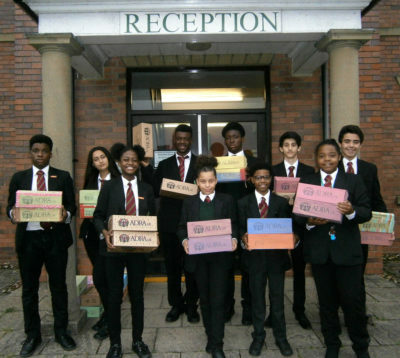 Our non-uniform day in aid of ADRA raised £205.55 for shipping cots. Additionally, staff members donated £ 619.76 to top up all the boxes, making sure they were packed to the rim with toys and school supplies. A big thank you to all for your generosity and commitment! Special thanks also go to Ms Sinclair, our Art teacher, who did a great job co-ordinating the decoration of the boxes. They all looked super creative. Check out the latest issue of The Stanboroughian! 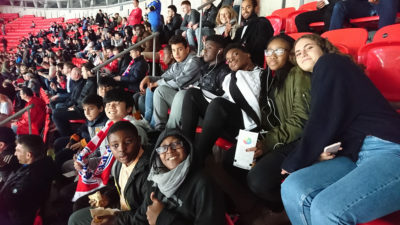 On the 5th October, our boarders went to Wembley Stadium to watch the England vs Slovenia match. Harry Kane scored the goal that secured England’s place in the 2018 World Cup! It was a sunny and bright Sunday with endless, clear, blue skies. At ten in the morning, on the 24th of September, the boarders and staff got on a coach to spend the day in Cambridge. The journey lasted an hour and a half but it felt shorter because my friends and I were chatting, listening to music, singing, and some of us were even sleeping. When we got there, we walked a shortwhile and then sat down to have a little snack. There was a small shop selling souvenirs next to where we were. The owner of the shop listened to us speaking Spanish and he started talking in Spanish with us too! The friendly shop keeper said that he visited Barcelona a couple of years ago and there he learnt a lot of Spanish words. He did not speak fluently, but we could understand him without making much effort. He told us that he remembered a very famous restaurant in Barcelona, but he could not remember its name. We thought he had a luxury and unique restaurant on his mind, but suddenly he recalled the name, and it was a restaurant called Cien Montaditos. This restaurant is known for being very speedy and cheap and there is a network of almost 400 of these restaurants around Spain. We were amused because the man liked the restaurant for having cheap beer. 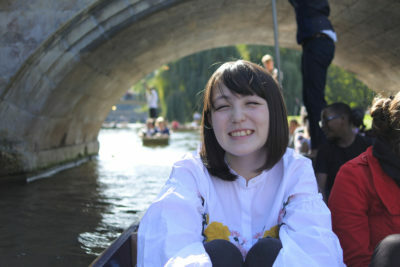 Soon afterwards, we got on the famous punts on the River Cam which flows through town. 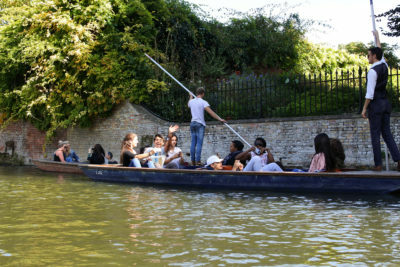 We divided into three groups, about ten people per punt, and each group had a tour guide explaining things about Cambridge, the different universities and places that were along the river bank. I really liked this part of the day, the experience of seeing universities in a very original way. After punting for about an hour some of us were starving, so we started on the sandwiches that the school provided for us. Then we met two tourist guides, who divided us into two groups for a walking street tour. The guide for my group was a man in his fifties, who was carrying a hiking rucksack and he seemed very professional and very prepared to walk for a long time. He started talking about Cambridge’s students and how one can apply and get accepted to such a prestigious university. He showed us some pictures of students who had graduated with excellent marks. He also explained to us how challenging the work is at Cambridge. Terms are shorter and there are a lot of exams, so basically, students spend three hard and stressful years studying every single day. But all hard work pays off in the end, right? The guide spoke about the town’s history, and that Cambridge University is second most ancient university in the world after Oxford. Its colleges have been working since 1209. He also told us that a lot of their documents were lost because monks were the ones in charge of writing and copying things, but during the Black Death, a lot of them died, and all the rest of people did not know how to write or barely even read. After the walking tour, we had some free time, so I went with my friends, María and Daurio, all around town. Although they were a little expensive, we bought some jumpers at the university’s gift shop because we wanted to have a memory of the trip. Then, we walked around streets what were very cute, small, and uncrowded. We also checked out a street market in the square that had many different stores with souvenirs, clothes and food for sale. There was even a Spanish food stand, and we talked to the man who was running it. He was selling croquetas, tortillas, cocido, churros, and many typical Spanish dishes that looked delicious. In the last few hours of free time, we went to the shopping centre, bought random things and just walked around. Before we had to head back, we decided to grab a couple of coffees at Starbucks, and surprisingly, the girl who was attending to us, was Spanish too! The girl had been studying in England for a year, and on weekends, she worked at Starbucks to earn some money. As our trip was coming to an end, we went back to the bus. I was upset that the trip was over because I wanted to have more free time to relax with my friends and explore the beautiful city. However, I did have a lot of fun doing all the exciting things on the trip. It turned out that we met a lot of Spanish people in Cambridge. On the ride back home, almost all of us slept because we were tired from all the walking. All in all, we had a great time and a memorable trip. September 20 2017 | Liubov Milis-Hopa | News | Comments Off on Superb GCSE Results! As you are undoubtedly aware, students sat new GCSEs in English Language, English Literature and Maths for the very first time this year. Not only is the content of the new GCSEs more challenging, the grading format has been amended from letters to numbers – from 9 to 1, with 9 being the top grade. 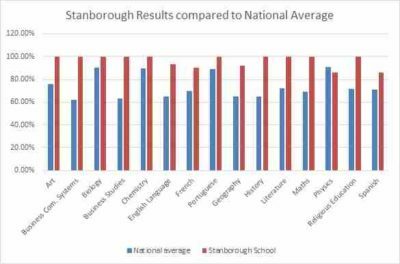 Despite the changes made, 100% of students who took GCSE exams at Stanborough Secondary school achieved five or more A* – C grades, with 93% including Maths and English. The students have worked hard and we are extremely proud of their accomplishments! In all subjects, with the exception of Physics, our students outperformed the national average. These outstanding results reflect the commitment of each student and the dedication of every teacher. I would like to take this opportunity to congratulate our students and thank our staff for successfully managing the challenges of the past two years to produce these superb results! Congratulations Mr and Mrs Zivanov! August 14 2017 | Liubov Milis-Hopa | News | Comments Off on Congratulations Mr and Mrs Zivanov! Aila (née Heck) and Nebojsa Zivanov met at Stanborough School. 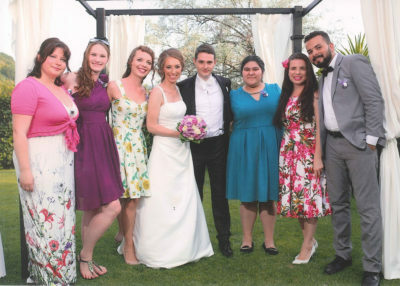 This super-cute pair fell in love while working at the Boarding School and got married on Monday July 24, 2017 at the beautiful Club Reset, Serbia. Around midnight, when the party was ending, the newlyweds and many of the guests jumped into the club’s swimming pool, with gowns and all. It was a perfect ending for a memorable day. We wish them much happiness! 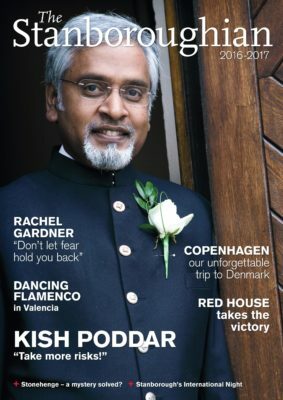 After teaching at Stanborough School for an impressive number of 29 years, our beloved Mr Poddar is retiring. To celebrate his outstanding contribution to our school community, we hosted a special Assembly on Monday 10th July. It was an emotive occasion with many black and white pictures, tales of older times and tears. 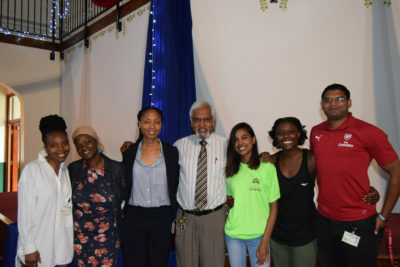 Several former students travelled to share in the moment, to tell all of us how Mr Poddar’s teaching inspired them. Many commented how his generosity and moral values, as much as his teaching, left an undeletable mark in their lives. “Thank you” seems so inadequate to express our gratitude to you, sir, for your life-commitment to educating young people. You’ll be sorely missed! 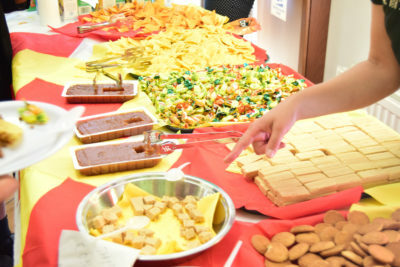 On Thursday 06th July, Stanborough School celebrated a very special Spanish Day. Our students practised their language skills by presenting a whole assembly in Spanish. Their power point presentation on important Spanish festivals captivated the audience. To top it off, the Cafeteria organized a great selection of Hispanic food that tickled our taste buds. 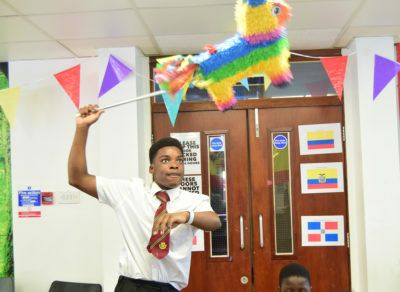 There was even a Piñata, which the students loved. Thank you Mrs Mabhena, the Spanish teacher, for making it possible! June 20 2017 | Liubov Milis-Hopa | News | Comments Off on Viva España! Would you like to improve your Spanish in Spain? That is precisely what our students did during the last half–term break! From 30 May to 5 June 2017, a group of seven students and two teachers visited Colegio Adventista Sagunto, our sister school in Valencia. Yet, the programme involved much more than taking Spanish lessons. 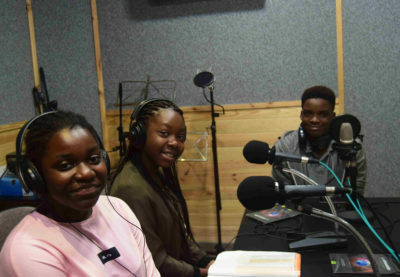 Our students explored the Hope Channel studio and became radio hosts for a day; they learnt to dance flamenco; visited castles and historic towns and, of course, went to the beach! The Spanish Exchange programme was a resounding success. Thank to you all who made it possible, and special thanks goes to Mr Juan Antonio Lopez, the Spanish programme coordinator. How Do You Know Summer Is Knocking?